"Hello? Anybody here?" I say as I drop my backpack to the ground. It's been 179 days since my last I post. Yeah, yeah, I know I'm slacking. But I'm slowly getting back into the groove. In any case, in my absence you may have noticed my partner-in-crime, Mr. McLeod, has started expanding his beery research, away from Albany and the Hudson Valley, into other areas and eras of New York state Specifically, he's been looking at Central New York, around the turn of the 19th century, and New York City from the period just before the Revolution, and just after. I'm following suit (just take a look at my brand-spankin' new "New York Beer" title, up above). I'll still be digging into Albany's beer past, but it's time to spread my wings a bit and see what other beer history related trouble from around the state I can get into. So where to start? At the beginning, right? The very beginning. Where and when was the first brew house in New York built? It's said, Dutch private-trader Adriaen Block and his fellow Captain Hendrick Christiaensen ordered their men to construct a brew house on the southern tip of Manhattan in 1612. That may be true, but the trouble is, there are as many versions of Block and Christiaensen voyages to the new world, as there are chili recipes in Texas. Quite often one version gets mixed with another, and events of the duo's first foray in 1612 are mingled with their subsequent trips. The facts are very much hidden under a plate of mis-informational spaghetti*. It's almost as if "1612" has been co-opted to encompass "the explorational endeavors of Adriaen Block and Hendrick Christiaensen between 1612 and 1614." A phenomenon not unlike the usage of "The War of 1812", which implies the start of the war in 1812, but reflects the entire two and a half years of the conflict. A detail of the Block Figurative Map. Block and Christiaensen did indeed travel to what would become Manhattan in 1612—but not to settle it. At least not at that point. The objective of the 1612 mission, as to seems to me, was to determine the viability of the area—which had been previously explored by Hudson, only a few years earlier—as to its ability to continually fill the warehouses of Amsterdam with beaver pelts. The duo's 1612 trip was the very definition of an exploratory mission—a testing of the waters (pun intended) of their business partnership with each other, the merchants of Amsterdam, and the New World. If Block and Christiaensen were on Manhattan not to establish a settlement, but rather to act as speculators in the fur trade there, intending to only stay in “Terra Nova” for a short time. Logically, they would have stocked their holds with enough beer, spirits, water and food for a trip from Europe and back again—so then why build a brew-house? I have a theory—and it's very much a theory—since primary sources are few and far between. Block and Christiaensen may have built their brew house, but perhaps not in 1612. Perhaps it happened, instead, on their second trip to Manhattan in 1613. Sailing for Amsterdam merchants—the Van Tweenhusyen Syndicate—the duo returned to the New World on a mission of not just trading, but securing the beaver pelt trade. The 1612 trip had produced in spades, so, the idea of establishing a trading post at that point seems logical, and because of an incident in late 1613 or early 1614, and as the old saying goes, misfortune breeds opportunity. 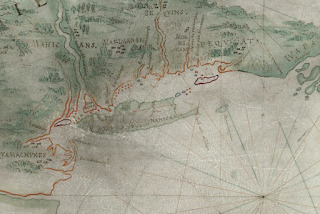 Block and Christiaensen planned to expand and divide-up trading territories in North America; extending them inland and up the Hudson, or Mauritius River as it was known to the Dutch, and east past the treacherous waters of the East River’s Hellegat, or Hell Gate, which led to the Long Island Sound; and to diminish the success of any other traders working for competitor merchants. Christiaensen left Amsterdam first, onboard his ship the Fortyun. Upon his late-autumn arrival in the New World, he engaged in a trading war with Volckert Mossel, a Captain working for a rival syndicate who had also recently arrived in the area. Block's ship the Tijger sailed into the harbor shortly thereafter. Trading was excellent for the Captains, despite Mossel. However, as Block and Christiaensen prepared to depart for Amsterdam the Tijger caught fire and burned to the waterline. Block’s cargo and provisions were completely destroyed. Block and his crew were stranded. Christiaensen’s ship was no where near large enough to accommodate a second crew, and although Mossel offered to split the crew between his ship, the Nachtagael, and the Fortuyn, (in exchange for half Christiaensen’s pelts), Block refused Mossel's offer and chose to stay the winter on Manhattan with his crew. It's unclear if Christiansen stayed the winter with Block or sailed north before the river froze, but eventually he would head north, 150 miles, looking for trading opportunities with the Mahicans. “Last Satterday night came in the Nonsuch Ketch from the Northwest passage. Since I have endeavored to find the proceeds of their voyage, only understand they were environed with ice about 6 months first halting their ketch on shore, and building them a house. They carried provisions on shore and brewed Ale and beer and provided against the cold, which was their work:"
There’s no evidence that Block or Christiaensen traded beer made on Manhattan with the Lenape, but alcohol was often used by the Dutch to keep the neighbors happy. Metal trinkets and beads were nice, but alcohol played a two-fold role for Dutch traders. It provided a more desirable trade item, and it also clouded the judgments of the Indians, allowing the Dutch to take advantage of them. Robert Juet, an officer aboard the Halve Maen, on Henry Hudson’s 1609 journey up the Hudson, described in his journal an encounter with the Mahicans. The locals were given wine and aqua vitae—to excess—and two days later returned with gifts of wampum and venison. Undeterred in his mission, Block used his extended stay in the new world wisely. Over the winter he had a yacht built, the Onrust, from salvaged pieces of the Tijger. As soon as the ice cleared, he used the small and maneuverable vessel to trade the coastlines of Long Island, Connecticut, Rhode Island, Cape Cod, the eponymously named Block Island, and explored the Connecticut River, to Hartford. 150 miles to the north Christiansen, for his part, built a small warehouse surrounded by a stockade to use as an inland fur trading post, named it Fort Nassau—in honor of the House of Orange-Nassau—and it maned with a garrison of ten or twelve men. 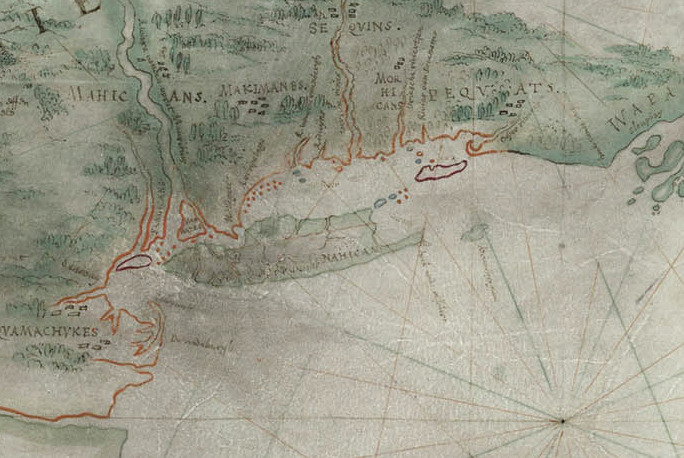 The Fortuyn, less its men who stayed at Fort Nassau**, sailed south from the outpost and rendezvoused with the Onrust off the coast of Massachusetts in the late spring of 1614. She made Amsterdam in July of that year. The warehouse Christiaensen built became the fist permenant Dutch settlement in the New World, and later, Albany. *An example of the confusion: Victor Palsits, archivist, librarian and New York history scholar, was quoted in the Nineteenth Annual Report, 1914, of the American Scenic and Historic Preservation Society, saying: "Working wholly from the original sources of documents and contemporary printed works, I claim that Block's Tiger was burned up the Hudson in the vicinity of modern Albany and that the Restless [Onrust] was built there." However, two years later in 1916, the remains of what was most likely the Tijer, were unearthed by construction workers digging the Seventh Avenue line of New York's subway system. **Christiaensen's fate is another mystery. At some point Christiaensen was murdered by "Orson", one of two sons of a Lenepe sachem, who traveled with the Dutchman. Some sources indicate that Orson, and his brother Valentine were "adopted" by Christiaensen on his first journey to the New World in 1612, and note that the brothers travelled with Block and Christiaensen back to the Netherlands that same year. Others imply that they met the brothers on their second trip. Christiaensen's death date is usually given as 1616. However, some sources state that Block was informed of Christiaensen's murder upon the Onrest's rendezvous with the Fortuyn in the summer 1614. Meaning he was killed at the fort. Other sources say Christiaensen, returned with Block and made numerous trips—as many as ten—back to the New World, after the dissolution of his partnership with Block. Meaning that he would have had to have returned to Europe at some point after establishing Fort Nassau in 1614.